Patrick Henry: Are you studying Patrick Henry? Do you love interactive notebooks? If so, this passage and interactive notebook flippable activity will work perfectly for you. Why do I think you will love my passages? I work very hard to research the information. I try to include a lot of info. and not leave gaps in history like some textbooks do. I try to write passages on one topic, so that it is easier for upper elementary to digest. I have been told I have a writing style that makes the topics easy to learn. I have taught the information for twenty years, PLUS... a bonus is that I confer with my husband who has taught US History for nearly twenty five years and has a Master's degree in US History. I can assure you that we make a great team when it comes to US History! Scroll down for more passages like this one. This passage covers details from Patrick Henry's life, including: he was a smart man, practiced law, outspoken member of the House of Burgesses, his dislike of taxes and laws by Britain, his desire for liberty with his famous 'give me liberty or give me death' mentioned, start of the Revolution, elected to be governor of Virginia. This passage will work as a reading or social studies lesson. 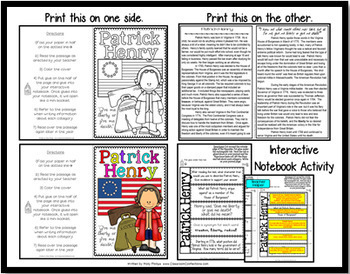 It can be used to introduce Patrick Henry or even to review details about him before test time. The passage is copied as a booklet style, meaning you will print on the front and back of one page. Students will then fold the one page booklet, so that there is a cute cover. When they open it up, they find the passage on the inside. It will glue perfectly inside their notebook. Once the passage is glued in their notebook, they can glue the flippable in the notebook. The flippable has 5 questions that go along with the passage. Patrick Henry is covered in our Georgia social studies standards as part of the American Revolution. This passage was written with 4th graders in mind, but it could be used with students beyond that grade, as well. Even if you are not a teacher in Georgia though, it will work perfectly, as they are non-fiction and don’t include anything specific to the state of Georgia. Please... if you ever notice anything in my passages that needs to be corrected, such as factual information, please send me a message before you rate the product. I do my best to research thoroughly and provide historical facts. I can look back over and have a new copy uploaded fairly quickly. Also, if you notice typos or anything else, that is appreciated too. Even with several sets of eyes looking over my work, at times a word can be missed. Thanks so much ahead of time. I appreciate each and every person that supports my love of creating fun activities. Interested in other passages like these?